It was 1989, and we were two years into our first business venture. The scene was a small apartment in Monterey, California, where my husband Mario and I lived at the time. After graduate school, I had said “no” to the corporate track and “yes” to our dream of having our own business. With the $5000 we had set aside for my engagement ring, we took the plunge and started our first business together. To keep us afloat, Mario kept his job as a waiter, working days with me on our dream and shuffling Mexican food at night. While I had spent 2 years getting my MBA, I quickly realized that no schooling could truly prepare us for the life of an entrepreneur. Now, two years in, we were feeling frustrated and concerned. Despite our efforts, the hours were long, cash was incredibly tight, profit margins were minuscule and the stress of the business was wearing on our marriage. It happened, that at about this time, my Dad and mom came to visit from Ohio. Because our apartment was so small, they stayed in a nearby hotel and hung out with us during the day. Looking back, I remember feeling incredibly self-conscious, as my Dad witnessed firsthand the whirlwind of activity that was our business at the time. You see, all my life I had watched my Dad excel as an entrepreneur. He had started with nothing and over the years, built numerous businesses, employed hundreds of people and provided nicely for his family. Having him see the “under belly” of our business was embarrassing. “Well, I had an idea of where we were headed when we first started, but the more we learned and the more we saw what was working and what wasn’t, things kept changing.” I could tell he was thinking about how to respond… wondering how forthright he should be with me. His question hung in the air. I felt awful. I had an MBA for God’s sake… I knew better. And so it began… my first lesson on business planning from my Dad. In the weeks and months that followed, Mario and I went back to the drawing board and looked at where we wanted to take the business based on all we had learned in those first years. At my Dad’s urging, we got clear about where we wanted to go, so we could lay the path to get there. This was my first lesson in vision crafting. After getting clear about where we wanted to be 5, 2 and 1 year from then, we began to create a plan for the year ahead. I remember my resistance. I don’t have time for this. Why create a plan, it’s only going to change? Or the real resistance… if I create a plan and it doesn’t happen then I will have failed. In the months that followed, we began to see a shift. We stopped changing direction every few weeks, we adjusted our pricing, identified our best-selling products and refined our marketing. But these weren’t the only changes that took place as a result of our plan. Something had shifted inside Mario and me. We were communicating more effectively, feeling more confident, being more productive and having a lot more fun. I remember marveling at how getting a plan on paper had such a dramatic impact on our overall success. Over the next 10 years, our plan continued to evolve, growing that first business to $2.5 million in annual revenues before selling it in 1999. Since then, we have started six additional businesses. Each time, we harnessed the power of planning, by taking the very same steps I share in my Quick Start Guide To Planning Your Best Year Yet. I’m curious… where are you in relationship to planning? Do you love planning or avoid it like the plague? Do you have a proven process or simply shoot from the hip? 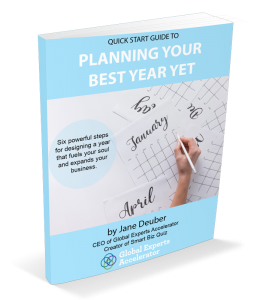 No matter where you are on your purposeful planning path, be sure to grab my Quick Start Guide For Planning Your Best Year Yet. Then, over the next two weeks, I’ll email you each morning with an insight or strategy for creating a plan for your best year yet. Together, we’ll get clear about what you want the coming year to hold and then map out a step-by-step plan to make it happen. What’s your relationship to planning? How does it make you feel? The more I understand where you are on your planning path, the more I can serve you in the weeks ahead. Each post equals one entry into a final drawing for a private consultation with me where we will refine your Freedom Plan for your Best Year Yet. I CAN so relate to the so called “plan” it took me many years to understand and make the shift. it’s actually so powerful. when we plan, we manifest and we invite that in mind to become a reality. yes it does work magic..
Ana, you hit the nail on the head… it is necessary! So honored to have you on this journey! I can totally relate to the frustrations of having a plan, then things changing, which changes the plan, so then it seems like I’m not far enough along in my business to create a plan. I guess I’m waiting until my business is far enough along so I can “accurately” create a plan. It feels like so much is out of my control when my plan depends on getting the few number of clients I need to progress to the next level. I think I’m seeing from this post that even if I don’t get that small number, then readjust to a smaller number — a smaller piece that I can progress on, changing the plan month by month? It’s also very difficult for me to envision 5 year goals. I can envision 1 year goals and have done it many times. But it’s always changed because I didn’t make the smaller client goals. Clearly I need help with this. Thanks for this post. I’m coming out of a needed two-year retirement to re-invent my photography business. It feels good to start fresh. I know what doesn’t work and few things that do. Determined to get the right start this time. So appreciate this training and just the right time for me. I studied Jane’s material years ago, but need to hear it again and put it into practice. I’m in a place to listen and do now. Thanks, Jane! I find that planning is extremely valuable. And like you said, sometimes, you think you have a plan in your head, but writing something specific down works so much better! Yeah Erin! I love that you are in the game and look forward to hearing more as the we round out the blog challenge. So powerful! And timely. Thanks! You are welcome, Dayton! ;0) Glad you are taking these steps. Wonderful article – thanks Jane for letting us all know how critical planning is to the successful outcome of any Project or Business! You are welcome! Up next… another favorite topic… powering up our productivity. ;0) Glad you are with us. Jane, what a difference a plan makes, what a difference a dad or another experienced business owner can make along your pathway to success. Now you are helping many. Thank you! A clear business plan. I have a hobby, not a business. I keep telling myself I want a business, and you just provided a way for me to prove it to myself. just waiting to here from them . A very wise man! Glad you guys were open to it! How I remember our MIIS business plan and team process..what crazy fun THAT was! Hello Nan! Seems like ages ago. ;0) I hope all is well. Are you considering starting your own venture? Inquiring minds want to know! What a great story! My family is not so supportive that way. It is also a great way to practice Covey’s second habit. Thank you for sharing. Interesting that we both wrote about our dads today. Your dad’s advice is exactly on point. And what I help clients with all the time and then sometimes fail to do consistently for myself. Thanks for sharing the story and reminding us. I really appreciate you sharing so much with us to help us all grow our businesses. I have long known I need to have a plan but have not actually sat down to create one. You have inspired me to really look at where I want to go with my little business and truly develop a strong vision to build the best business I can. Thank you so much! 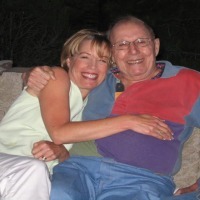 Hi Jane, Thanks for sharing your experience, and what a wonderful way for your father to approach helping you. I made my first business plan last weekend, and the feedback I was given wasn’t great. I’m interested in learning more. Thank you, Jane! It must be time for me to “get” this because it’s coming to me from so many different directions. I have no problem with my long term plan but I don’t understand how to put it into small enough steps for the day to day. So I end up, like you were, changing my plan frequently and doing a little of this and that which doesn’t get me where I want to go. It’s frustrating. I’m looking forward to your blog tomorrow! In working with both clients and in my own businesses, I was always fascinated by the resistance to planning. It comes naturally in many other areas of our lives. But when you add the word business, something changes. Thanks for sharing this and how a basic plan can change a really good idea into a business. What “plans” I’ve set down so far have been way too vague and broad. But my recent shift in awareness around what my message is all about is helping me see more of a path ahead. I know the plans you speak of are the next step. In the past I think I put too many things out there as my goals and didn’t reach them. Now I’m aiming to plan within shorter time spans and achieve some successes before I expand that out into months ahead. Excellent awareness, Linda! I am intrigued by you and would love to know more about what you are up to. The sky really is the limit when you lean into a plan. If you haven’t taken the self-assessment at http://www.RockYourBizQuiz.com, I highly recommend it as you flush out the details of your plan. So glad you are with us! Plans DO work! Someday you will look back and realize that your planing has changed you. Planing becomes easier. It can change who you are! Thank mom!!! (I can’t believe you saw this blog.) You should know about the power of planning. All those years dad was building businesses you were right there by his side. I am so luck to have both of you as parents! Love you! Catching up on the Blog this weekend. Since I have taken a look back at my business, gotten a vision & try to plan what I want in the coming year things have been looking up. I look forward to the revised edition! I certainly identify with your story as I have always seemed to have the plan mapped out in my head. I’ve taken somewhat of a passive approach to building my vision; simply just allowing the universe to nudge me to my next steps. I feel for a while that has served me, however, for the first time I feel like I am being forced to be more concrete with my vision in order to move forward. My revelation about planning is that it is to stake your claim in your vision and set the guideposts from which to build. Without planning there is no consistency, because the structure is so undefined that it gives way to the elements. Planning is commitment to expansion. Cool post thanks Jane- it is easy to carry your plan in your head and I find for me makes it easy to have the excuses as to why things don’t get done! 11 months into my business, I am proud of what I accomplished and the fear and worry that no longer live with me on a daily basis. This has been an exploratory year determining what might be possible in the community, if the community was receptive to my ideas and letting professionals as well as family caregivers know what they could learn from me and what they could expect working with me. I work out of my home, alone and while I have gotten some direction, no one has advised me in planning, I spent money however I felt was needed and am uncertain about how to proceed with 2019 although I have some ideas.